Innate immunity (also called natural or native immunity) provides the early line of defense against microbes. It consists of cellular and biochemical defense mechanisms that are in place even before infection and are poised to respond rapidly to infections. The mechanisms of innate immunity are specific for structures that are common to groups of related microbes and may not distinguish fine differences between microbes. (3) Blood proteins, including members of the complement system and other mediators of inflammation. Adaptive immunity (also called specific or acquired immunity) system recognizes and reacts to a large number of microbial and nonmicrobial substances. The defining characteristics of adaptive immunity are the ability to distinguish different substances, called specificity, and the ability to respond more vigorously to repeated exposures to the same microbe, known as memory. The unique components of adaptive immunity are cells called lymphocytes and their secreted products, such as antibodies. Foreign substances that induce specific immune responses or are recognized by lymphocytes or antibodies are called antigens. Figure 1. Just as resistance to disease can be innate (inborn) or acquired, the mechanisms mediating it can be correspondingly divided into innate (left) and adaptive (right), each composed of both cellular (lower half) and humoral elements (i.e. free in serum or body fluids; upper half). Adaptive mechanisms, more recently evolved, perform many of their functions by interacting with the older innate ones. Innate immunity is activated when cells use specialized sets of receptors (Pattern recognition receptor, PRR) to recognize different types of microorganisms (bacteria, viruses, etc.) that have managed to penetrate the host. Binding to these receptors activates a limited number of basic microbial disposal mechanisms, such as phagocytosis of bacteria by macrophages and neutrophils, or the release of antiviral interferons. Many of the mechanisms involved in innate immunity are largely the same as those responsible for non-specifically reacting to tissue damage, with the production of inflammation (cover up the right-hand part of Figure 1 to appreciate this). However, as the nature of the innate immune response depends on the type of infection, the term ‘nonspecific’, although often used as a synonym for ‘innate’, is not completely accurate. Adaptive immunity is based on the special properties of lymphocytes (T and B, lower right), which can respond selectively to thousands of different non-self-materials, or ‘antigens’, leading to specific memory and a permanently altered pattern of response - an adaptation to the animal’s own surroundings. Adaptive mechanisms can function on their own against certain antigens (cover up the left-hand part of Figure 1), but the majority of their effects are exerted by means of the interaction of antibody with complement and the phagocytic cells of innate immunity, and of T cells with macrophages (broken lines). Through their activation of these innate mechanisms, adaptive responses frequently provoke inflammation, either acute or chronic; when it becomes a nuisance this is called hypersensitivity. Figure 2. Innate and adaptive immunity time line. The mechanisms of innate immunity provide the initial defense against infections. Adaptive immune responses develop later and require the activation of lymphocytes. The kinetics of the innate and adaptive immune responses are approximations and may vary in different infections. Innate and adaptive immune responses are components of an integrated system of host defense in which numerous cells and molecules function cooperatively. The mechanisms of innate immunity provide effective initial defense against infections. However, many pathogenic microbes have evolved to resist innate immunity, and their elimination requires the more powerful mechanisms of adaptive immunity. 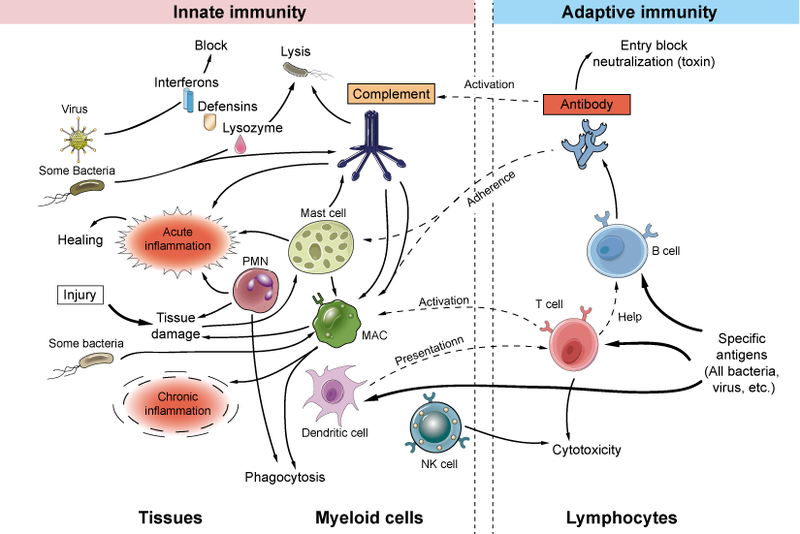 There are numerous connections between the innate and adaptive immune systems. The innate immune response to microbes stimulates adaptive immune responses and influences the nature of the adaptive responses. Conversely, adaptive immune responses often work by enhancing the protective mechanisms of innate immunity, making them more capable of effectively combating pathogenic microbes. Interferons: A family of proteins produced rapidly by many cells in response to virus infection, which block the replication of virus in the infected cell and its neighbors. Interferons also have an important role in communication between immune cells. Defensins: Antimicrobial peptides, particularly important in the early protection of the lungs and digestive tract against bacteria. Lysozyme (muramidase): An enzyme secreted by macrophages that attacks the cell wall of some bacteria. Complement: A group of proteins present in serum which when activated produce widespread inflammatory effects, as well as lysis of bacteria, etc. Some bacteria activate complement directly, while others only do so with the help of antibody. Lysis: Irreversible leakage of cell contents following membrane damage. In the case of a bacterium this would be fatal to the microbe. Mast cell: A large tissue cell that releases inflammatory mediators when damaged, and also under the influence of antibody. By increasing vascular permeability, inflammation allows complement and cells to enter the tissues from the blood. PMN: Polymorphonuclear leucocyte (80% of white cells in human blood), a short-lived ‘scavenger’ blood cell whose granules contain powerful bactericidal enzymes. The name derives from the peculiar shapes of the nuclei. MAC: Macrophage, a large tissue cell responsible for removing damaged tissue, cells, bacteria, etc. Both PMNs and macrophages come from the bone marrow, and are therefore classed as myeloid cells. DC: Dendritic cells present antigen to T cells, and thus initiate all T-cell-dependent immune responses. Not to be confused with follicular dendritic cells, which store antigen for B cells. Phagocytosis (‘cell eating’): Engulfment of a particle by a cell. Macrophages and PMNs (which used to be called ‘microphages’) are the most important phagocytic cells. The great majority of foreign materials entering the tissues are ultimately disposed of by this mechanism. Cytotoxicity: Macrophages can kill some targets (perhaps including tumor cells) without phagocytosing them, and there are a variety of other cells with cytotoxic abilities. NK (natural killer) cell: A lymphocyte-like cell capable of killing some targets, notably virus-infected cells and tumor cells, but without the receptor or the fine specificity characteristic of true lymphocytes. Antigen: Strictly speaking, a substance that stimulates the production of antibody. However, the term is applied to substances that stimulate any type of adaptive immune response. Typically, antigens are foreign (‘non-self’) and either particulate (e.g. cells, bacteria) or large protein or polysaccharide molecules. Under special conditions small molecules and even ‘self’ components can become antigenic. Specific, Specificity: Terms used to denote the production of an immune response more or less selective for the stimulus, such as a lymphocyte that responds to, or an antibody that ‘fits’ a particular antigen. For example, antibody against measles virus will not bind to mumps virus: it is ‘specific’ for measles. Lymphocyte: A small cell found in blood, from which it recirculates through the tissues and back via the lymph, ‘policing’ the body for non-self-material. Its ability to recognize individual antigens through its specialized surface receptors and to divide into numerous cells of identical specificity and long lifespan makes it the ideal cell for adaptive responses. Two major populations of lymphocytes are recognized: T and B. B lymphocytes: Secrete antibody, the humoral element of adaptive immunity. Antibody: Is a major fraction of serum proteins, often called immunoglobulin. It is made up of a collection of very similar proteins each able to bind specifically to different antigens, and resulting in a very large repertoire of antigen-binding molecules. Antibodies can bind to and neutralize bacterial toxins and some viruses directly but they also act by opsonization and by activating complement on the surface of invading pathogens. T (‘thymus-derived’) lymphocytes: Are further divided into subpopulations that ‘help’ B lymphocytes, kill virus-infected cells, activate macrophages and drive inflammation. Opsonization: A phenomenon whereby antibodies bind to the surface of bacteria, viruses or other parasites, and increase their adherence and phagocytosis. Antibody also activates complement on the surface of invading pathogens. Adaptive immunity thus harnesses innate immunity to destroy many microorganisms. Complement: As mentioned above, complement is often activated by antibody bound to microbial surfaces. However, binding of complement to antigen can also greatly increase its ability to activate a strong and lasting B-cell response – an example of ‘reverse interaction’ between adaptive and innate immune mechanisms. 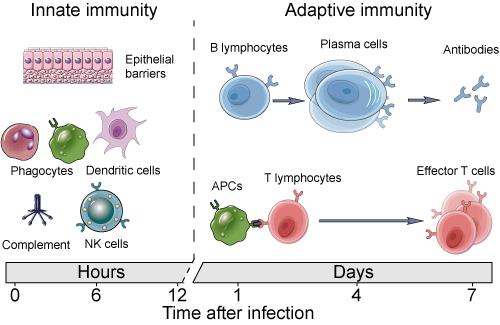 Presentation of antigens to T and B cells by dendritic cells is necessary for most adaptive responses; presentation by dendritic cells usually requires activation of these cells by contact with microbial components (e.g. bacterial cell walls), another example of ‘reverse interaction’ between adaptive and innate immune mechanisms. Help by T cells is required for many branches of both adaptive and innate immunity. T-cell help is required for the secretion of most antibodies by B cells, for activating macrophages to kill intracellular pathogens and for an effective cytotoxic T-cell response.